Mark Zuffo is a Brookwood Group shareholder who served as an officer of the firm through May 2014. He is currently employed with the Presidio Trust in San Francisco and remains a trusted advisor to Brookwood. Mark has 33 years of professional real estate experience that has included leasing, acquisition, property management, asset management, project management, and contract negotiations. While at Brookwood Group his responsibilities included the negotiation and management of Public Private Partnerships, for which he is uniquely qualified. 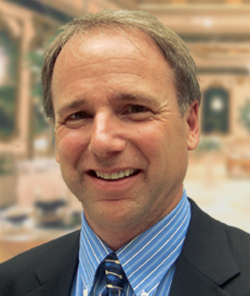 From 2000 to 2011 Mark served in several key positions with the University of California, San Francisco (UCSF) which included Director for UCSF Real Estate Services where he directed leasing, acquisitions, general property dispositions, asset management, and development of new campus facilities through Public Private Partnerships (P3). The portfolio at UCSF comprised 1.2 million square feet of leased office, retail, industrial, laboratory, clinical, research, educational and residential space. In 2008 Mark played a critical role in launching the UCSF P3 team efforts through successful negotiations, execution and construction commencement for the Neuroscience Building at UCSF’s new Mission Bay Campus in San Francisco, a $200M, 237,000 square foot facility. He was instrumental in leading negotiations for site acquisition/assemblage for the UCSF Medical Center at Mission Bay presently under construction. Between 1997 and 2000 Mark served as Real Property Officer for the City and County of San Francisco’s Real Estate Department where he was responsible for all phases of the real estate transaction cycle including implementation of easements, street vacations and preparation of ordinances/resolutions. In addition, he served as the Property Manager for the City’s administrative office building located at 25 Van Ness Avenue in San Francisco overseeing the building’s major renovations and tenant improvements. In 1991 Mark co-founded and operated Starboard Commercial Real Estate, a brokerage firm specializing in office and industrial building sales and leasing in the San Francisco Bay Area. Mark holds a Bachelor of Science degree from the Eberhardt School of Business, University of the Pacific in Stockton, California. He is a member of the Association of University Real Estate Officials (AUREO) and recently served as its President.